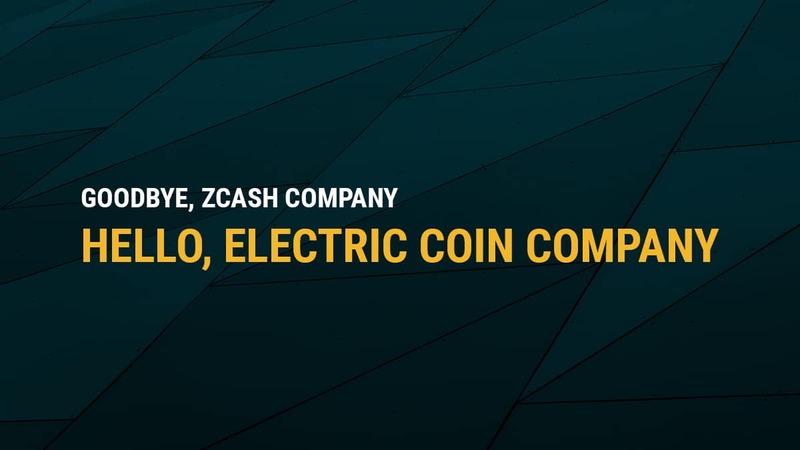 The Zcash Company is now the Electric Coin Company. We’re changing the name for clarity. But, the company isn’t “Zcash.” Zcash is the cryptocurrency we build and support, with the help of others in the community. Also, we aren’t the Zcash Foundation. The Foundation is a separate and independent 501(c)(3) nonprofit organization. It has its own mission, team and board of directors. So here we are: Electric Coin Company. It’ll take us a little while to get the new branding right, launch a new domain and change out the sign at the office, but the name change is public, so we wanted to make sure we were on record confirming it. Only the name has changed. We are the same team, with the same mission: to empower everyone with economic freedom and opportunity. We developed and help steward Zcash. You may have more questions about this move and the company in general. Follow the links to the answers. Will the Electric Coin Company continue to be solely focused on Zcash? What specifically does the Electric Coin Company do? What changes are planned as a result? The Electric Coin Company is focused on building and supporting Zcash. That includes research and engineering that may, or may not, ever make it into Zcash software. This has been our mission from the very beginning, and we will continue to drive innovation and adoption. The company will use the Electric Coin Company for all messaging and correspondence. This will happen immediately. The Electric Coin Company information will be moved from https://z.cash/ to a new domain with its own website. This includes company and team information and the company-maintained blog. Company email addresses will change to the new domain. Social media properties including Twitter, LinkedIn, Facebook will change to reflect the new name. So, that’s it then — Electric Coin Company. The company name has changed but our commitment has not. The path forward is filled with both opportunity and challenges, and we thank you for your support.